As you probably know, golf has been around for a while. Several hundred years, in fact. It's only natural that certain myths would take root over the centuries. The major myths about the golf swing are based in truth. Perhaps that's why they've survived so long. The problem is, they're easily misinterpreted. To this day, the big myths are still repeated on courses and driving ranges everywhere, every day – often with the best of intentions, but doing more harm than good. “Keep your head down”: Whenever a golfer tops the ball, someone in his group will invariably remark, “You looked up.” While it's true that turning the head away from the ball before contact can cause mishits, the concept of keeping the head down dangerously oversimplifies things. Problems occur when golfers, especially beginners, take the phrase too literally. Intent on keep the head still and the eyes locked onto the ball throughout the swing, they tense up through the neck and shoulders, inhibiting their ability to make a full backswing turn. On the downswing, this tension prevents them from turning fluidly through the shot, stiffening the arms and creating all kinds of ugly results. Fact is, the head should be allowed to swivel a little bit, naturally, on the backswing and downswing. Stay focused on the ball, but let the head come up (turn toward the target) with the right shoulder after impact. Make sure your neck and shoulders are nice and loose before you swing. Beginners get into big trouble when they try to lengthen the backswing by bending the arm. Instead, length should be created by a complete shoulder turn – ideally, the shoulders should be perpendicular to the target line at the top of the backswing on a full shot. If you're flexible enough to reach this point, maintaining a straight (but not rigid) left arm should be fairly easy. “Swing slowly”: Yet another piece of well-meaning advice that doesn't work so well if practiced literally. Golfers who concentrate on swinging slowly usually fail to accelerate the club into the ball. The lack of clubhead speed kills their distance, and the decelerating movement causes wayward, poorly struck shots. While some famous professional golfers appear to swing slowly – Ernie Els and Fred Couples come to mind – others like Nick Price have very quick swings. What you're seeing is called tempo, which is akin to rhythm, and it varies for every player. Every golfer has a natural tempo (follow the link to learn how to find yours). What's important is developing a swing based on this tempo, be it slow, fast or in between. There is a lot of great golf instruction out there waiting to help you become a better player. If you listen to the right voices, and are willing to work hard on the tips that you receive, it is certainly possible to take your game to new heights. Unfortunately, there are also plenty of bad pieces of advice waiting for you as well, and those swing myths can quickly undo any progress that you have made in your game. To stay on track toward lower and lower scores as time goes by, you need to make sure you are only listening to good advice while leaving the rest behind. In this article, we are going to highlight some of the biggest swing myths that have been perpetuated over the years. Some of these myths are minor points that may not affect your game too much one way or another. However, some of them are major issues that you need to understand in order to play well. Sorting out fact from fiction isn't always the easiest task in the golf world, but that is exactly what you need to do if you wish to play at a high level. One of the first things you can do to make sure you don't fall for any of the swing myths that get passed around on the course is to always consider the source of the information you are receiving. If a person is trying to offer you expert swing advice – while slicing the ball all over the course on their way to shooting 100+ - they might not actually know what they are talking about. Take golf advice only from established, trusted sources, and ignore the rest. There is only so much room in your brain for taking in information about the golf swing, so you might as well accept info only from those who you can trust. Another point to keep in mind on this topic is the fact that there are no magical 'secrets' or anything like that in the game of golf. If someone tells you they have the secret which can 'unlock' great performance in your game, you can feel free to ignore them at once. You are never going to find a single secret or specific tip that is going to allow you to suddenly play brilliant golf. This is the hardest game in the world, and improvement only comes gradually through hard work and study. Yes, learning about the game can help you to play better without a doubt, but that education is going to need to go far beyond one 'magic tip'. One of the most-destructive concepts in the game of golf is the idea of a weight shift. This swing myth would have you to believe that you need to intentionally move your weight to the right during the backswing, and to the left during the downswing. Quite simply, that is not true. While your weight may move slightly in those directions during the swing, that movement will be a response to other actions, not an intentional act to move from side to side. Golfers who sway from side to side on purpose during the swing usually have great difficulty creating club head speed, and they very frequently hit a slice as well. So, if you aren't trying to slide from side to side during the swing, what should you be doing instead? Rotating. The golf swing is a rotational action by nature, and you want to focus on optimizing your rotation in order to develop a powerful and accurate swing. When you can use rotation rather than lateral movement in order to move the club, you will have the potential to create tremendous swing speed without losing your balance for even a moment. The best golfers in the world largely rely on rotation to create their powerful swings, and you should be doing the same. To get rid of your weight shift, focus on the action of your right knee during the backswing. As you swing the club back away from the ball, you need to keep your right knee as stable as possible to avoid sliding away from the target. When your right knee starts to move to the right, your weight will go with it and you will be unable to rotate properly. In this way, you can keep the early stages of your swing very simple – swing back without allowing your right knee to drift to the right. If you can do so successfully, there is a great chance that you will be on track for a powerful swing that is driven by rotation instead of lateral movement. If you are used to sliding right and left during your swing, it is going to take some time to get comfortable with the idea of swinging in a rotational manner. However, you can certainly make the adjustment, as long as you are willing to put in a bit of work on the driving range. The key to success with a rotational swing is being willing to rotate hard toward the target on the way down toward the ball. It is relatively easy for most golfers to make a good turn going back, but few do a good job of turning to the left through impact. Commit yourself to a powerful downswing with plenty of rotation and your ball striking is almost sure to improve. This might not be a tip that you would expect to see on this list. After all, the idea of keeping your head down is one of the first things you learn as a golfer, so most players assume that it has to be true. In reality, this tip is one that usually does more harm than good. If you try too hard to keep your head down during the swing, there is a good chance that you will limit the rotation that you can make through the shot – meaning you will never live up to your power potential. On this point, there is a very important distinction to be made between your head and your eyes. You don't need to keep your head down in order to make a good golf swing, but you should be trying to keep your eyes down on the ball throughout the swing. That might seem like a subtle difference, but it is extremely important. You certainly need to watch the ball as you swing, because it is very difficult to make solid contact with something that you can't see. However, keeping your eyes down is not the same as keeping your head down, and you should feel free to move your head slightly in the swing to accommodate your aggressive swing through the ball. If you are trying to hold your head still while you swing, it is almost certain that you are going to struggle to create speed through the hitting area. Your shoulders and the rest of your upper body will get stuck, as they aren't able to swing through impact freely without bringing your head along for the ride. Many amateur golfers, conditioned to think they shouldn't move their head, hold themselves back from reaching their potential just because they are trying to stick with this outdated myth. The sooner you can let go of the idea that you have to keep your head still, the sooner you can start to really unleash some power through the ball with each of the clubs in your bag. As you think about this point and what it means for your swing, you should make a clear distinction in your head between the short game and the long game. In the short game, you do want to make sure your head stays still, as a still head is going to help you make clean, solid contact time after time. You don't have to concern yourself with power and rotation in the short game, so keeping your head down and still is the right way to go. It is only when you get out to the long game that you don't need to worry about this point, since the development of swing speed is going to take precedence over your attempts to hold your head perfectly still. There is a portion of the golfing population that believes it is necessary to keep the left arm perfectly straight throughout the golf swing in order to hit good shots. These people will tell you that keeping your left arm straight creates width in the swing, and width is a big part of the equation when it comes to power generation. While width absolutely is a good thing in the golf swing, it doesn't not have to come as a result of keeping your left arm perfectly straight. It is safe to say that anyone who thinks the left arm has to be straight in order to play good golf has never heard of Jordan Spieth. One of the very best golfers in the world, Spieth already owns a Masters victory, a U.S. Open championship, and many other titles – despite the fact that his career is just getting started. By any measure, Spieth is among the greats of the game, and yet his left arm is certainly not straight at the top of his swing. If this point was so important, wouldn't you think that it would be followed by one of the game's best? Of course, the reason that Spieth doesn't worry about the position of his left arm at the top of the swing is because his swing works just fine the way it is. Sure, you can play golf with a straight left arm, and many top players do, but it is not in any way necessary. It is very much possible to play at a high level with a slightly bent left arm, as is being proven on a regular basis by Jordan Spieth. So, should you go out of your way to bend your left arm during your backswing in order to play more like Spieth? No – of course not. The point is not that you should try intentionally to bend your left arm, but rather that you shouldn't force yourself to keep it straight. 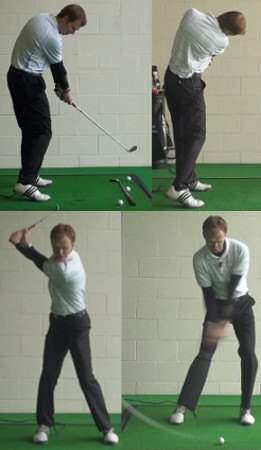 In an attempt to keep the left arm as straight as possible, many players get themselves into a tense and tight position before the swing even begins. There is nothing good about having tension in your swing for any reason, so don't lock out your muscles just to keep that left arm as straight as you can. Instead, focus on the other fundamentals in your swing and let the left arm do what it is going to do naturally. If it wants to stay straight as a result of your other mechanics, that is just fine – if it wants to bend, that is fine too. In the end, this is a point that just doesn't need your attention, as there are far more important things to worry about in the swing. Despite what some people would have you believe, the lower body is actually the engine that drives the golf swing forward toward the target. If you aren't using your lower body aggressively in the downswing, you are missing out on a huge opportunity to build power prior to reaching impact. Unfortunately, some people in the game spread the myth that the lower body should be quiet throughout the swing, which is as wrong as wrong can be. If you would like to get the most out of your swing going forward, doing everything you can do involve your lower body is a great idea. Part of the problem as it relates to this myth is all of the attention that is paid to the shoulder turn by the average player. Most golfers know that they need to turn their shoulders as far as they can during the backswing in order to create space between the club and the ball prior to the downswing. Turning the shoulders going back is absolutely a key ingredient in the swing, and one that should not be overlooked. However, that is only half of the rotation battle, and the swing will never be effective unless the lower body finishes what the upper body has started. Once your backswing is finished, the job of creating rotation switches from the shoulders down into the hips. On the way forward, your hips need to lead the way, creating a powerful rotation to the left that will be followed by the torso, the arms, and eventually, the club. If you were to only try to rotate your shoulders forward while your hips remained stationary, you would never be able to generate the kind of speed that you are capable of when your lower body plays a role. By transferring power from your shoulders to your hips, the dynamics of the swing change for the better and impressive ball striking suddenly becomes possible. Just as with our previous myth, this is a point that does not apply the same way to the long game as it does to the short game. In the long game, you need to use your lower body actively to create power throughout the downswing. In the long game, however, that simply isn't how it works. Instead, you do want to keep your lower body quiet while playing short shots, as the stability provided from a quiet lower body will do wonders for your putting, chipping, and pitching. As you work on your short game, go ahead and keep your lower body as quiet as possible in order to promote consistency and distance control. This is a myth that doesn't make any sense right off the top, yet many golfers still believe it to be true. When you hear golf tips being passed around at the driving range among fellow players, you are very likely to hear someone say that you actually need to swing softer if you want to hit the ball farther. Does that make any sense to you? Probably not – because swing speed is the number one ingredient in creating distance on your shots. If you want to hit the ball far, you don't need to swing soft. In fact, you need to swing very, very hard. Of course, there are limits to how hard you can swing, and that is probably how this myth got started in the first place. It is true that you don't want to swing so hard that you pull yourself off balance, so it would be a good idea to back off a bit if you are regularly losing your balance in the downswing or follow through. That is not an issue for most players, however. In reality most amateur golfers need to swing harder, provided they swing harder in the right places and at the right times. When is the right time to swing hard? When the club is about to contact the ball, of course. You want the swing to be moving at maximum speed when you make contact, so you should really be pouring on the effort just prior to impact. Sadly, many amateur golfers swing hard well before this point in the swing, wasting their speed during the transition or even during the backswing. You can afford to build up your swing speed gradually from the takeaway on through to impact, as long as the club is moving as fast as possible when the club touches the back of the ball. Many amateur golfers hold back when they swing through the ball, afraid to swing hard because they are expecting to hit the ball off-line. There is no room for this kind of fear or doubt in the game of golf. Every swing you make needs to be made with a total commitment to a successful outcome. Is every shot that you hit going to be a good one? No – of course not. No one hits every one of their shots on target, and there is no such thing as perfect in the game of golf. Understanding that important point can actually free you up to make an aggressive, powerful swing time after time. This line of thinking applies specifically to the shots that you hit with your driver from the tee. The driver is a club that is all about power, and you will be best served to 'turn it loose' through the hitting area in order to maximize distance. Many golfers are surprised to find that they actually hit the ball more accurately as well as farther when they commit to swinging hard. An aggressive swing is one that will usually release properly through the hitting area, meaning the club is more likely to get back to a square position than if you try to guide the ball into the fairway with a weak swing. By trusting yourself and swinging hard all the way through the finish, you might just hit more fairways while adding distance at the same time. If you have been trapped by any of the myths on the list above, you will do well to free yourself from thinking about these points immediately. Forget about listening to these myths and instead get back to focusing on basics that allow you to play your best – things like balance, grip, stance, confidence, and more. Remember, only take swing advice from reliable sources, and always keep your game as simple as possible, whether on the driving range or out on the course. Play well!